Posted January 28th, 2019 by Martin Slater & filed under Services. Posted September 20th, 2018 by Martin Slater & filed under Services. The September meeting of EFMC-IMCS was in the picturesque city of Ljubljana, nestled amongst the surrounding mountains, with its many bridges, hilltop castle and numerous riverside eateries. The good food, wines and beers alone would have made the visit worthwhile, but there was more than enough excellent science to keep us in the conference centre. With three separate scientific tracks: Therapeutic Areas, Technologies and Chemical Biology, it was impossible for the 800 plus delegates to see everything (much like an ACS meeting), but the busy schedule meant that there was something for everybody. Fittingly, the opening on Sunday included a fascinating talk by the Slovenian academic and Zika virus expert Prof. Tatjana Avsic-Zupanc (University of Ljubljana) who was the first to characterize the link between Zika infection and foetal abnormalities and to identify a causative molecular target: PrM protein mutant S139N. Bayard Huck (Merck Biopharm) presented his interpretation of their strategy towards the evolution of the medicinal chemist, a technology and multi-discipline embracing ‘Versatilist’, the scientist equivalent of a ‘Swiss army knife’. Bayard went on to describe virtual screening (one of Cresset Discovery Services’ areas of expertize) as vital for increasing cost-effectiveness. He also described the current mania with all things AI as being at the peak of inflated expectations in the Gartner hype cycle, although he noted that useful applications are emerging from the hype. Bayard elaborated further on the nature of workspace and how the removal of ‘silos’ is essential for effective innovation to occur between scientists, which sounded remarkably familiar to me; I realised later that it was the open structure of the Cresset office I was thinking of. Prof. Christa Müller’s (University of Bonn) talk about purines: P2X, P2Y, P1 and P0 related receptors and enzymes, and Prof. Peter Seeberger’s (Max Planck Institute of Colloids and Interfaces) talk about the development and use of a remarkable, state-of-the-art automated glycan synthesiser for synthetic vaccine discovery got the conference off to a cracking start. There were several themes running through the conference including: immuno-oncology, a real opportunity to tackle cancer, targeted degradation as a completely new therapeutic paradigm and the emergence of various AI strategies. Marwin Segler (Benevolent AI) showed how deep learning could be used for evaluation of millions of possible synthetic routes to a novel compound. First time disclosures are shown in table 1. 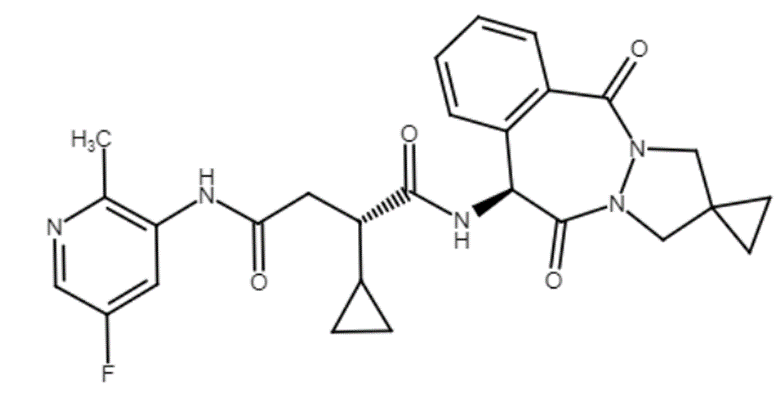 Risdiplam has the electrostatic hallmarks of an RNA/DNA nucleotide base interactor (a relatively electron deficient heterocycle which is then more suited to face on face interaction with nucleotide bases) in a similar manner to the fluoroquinolone antibiotics e.g., grepafloxacin (Figure 1). Figure 1. 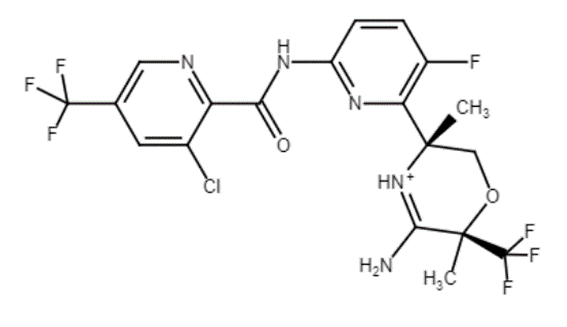 Risdiplam structure (left) with electrostatic surface (red = positive and Blue = negative) and that of Grepafloxin (right). GPCR talks that caught my eye are captured in table 2 and include: A MgluR2 ligand talk by Jose Cid (Jannsen), a GabbaB ligand talk by Sean Turner (AbbVie). Also, a very nice talk by Anne Valade (UCB) describing deuterium exchange as a method for identifying the allosteric ligand binding site for the dopamine D1 receptor. 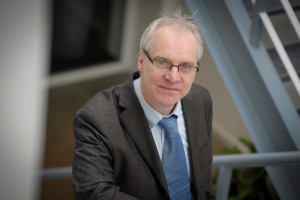 Finally, a first disclosure from Stefan Bäurle (Bayer) on their collaboration with Evotec. Table 2: GPCR ligand structures. Other ligands captured from talks that were interesting are shown in table 3. Of particular interest was the superb talk by Allan Jordan, Cancer Research UK, which possibly wins the prize for the ugliest looking validated hit. Table 3: Ligands from other diverse talks of note. Overall it was a successful, enjoyable and informative EFMC-ISMC symposium. Posted August 30th, 2018 by Martin Slater & filed under Services. 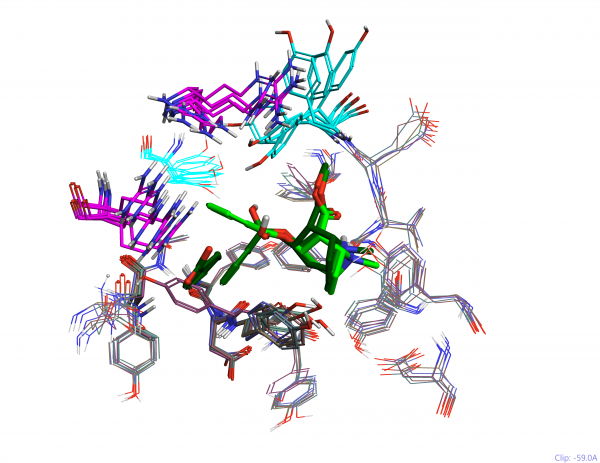 Cresset is well known for powerful and accurate ligand-centric modeling, and Flare has established our methods for protein-ligand interactions. 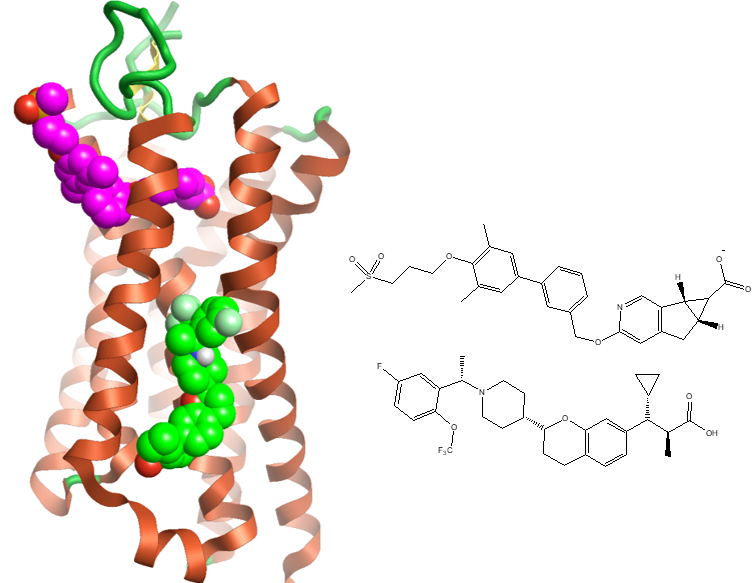 Work on GPCR modeling and viruses demonstrates the effectiveness and potential of Cresset technology for protein-protein interactions. Here I discuss the successes and challenges of modeling ‘big’ – applying Cresset’s XED force field to biologics. 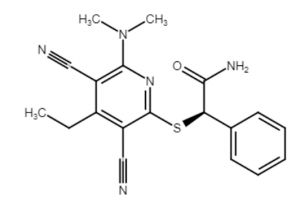 In 2014 Dr Andy Vinter, Cresset founder, reported on GPCR modeling exercises using the XED force field1, where ligand poses were exhaustively explored together with full complex minimizations to provide qualitative or quantitative analyses with binding estimates for agonist v antagonists. Although this was a huge modeling challenge, the approach provided fascinating new insights into GPCR behaviour that are in keeping with more recent literature. In particular, Brian Kobilka (joint winner of the 2012 Nobel Chemistry Prize) published a paper in 2016 showcasing the use of specific nanobody binding to the intracellular side of the GPCR to probe the long-range influence of ligands at the extracellular side2. He provided evidence supporting the hypothesis that GPCRs are likely partitioned between different states by differential stabilization of the full complexes in response to ligands. Our modeling findings concur in that the subtleties of these interactions extend beyond direct local binding interaction events and are propagated at distance across the full protein complex. Long-distance effects are not unusual in the realm of protein-protein interactions yet are beyond the scope of traditional molecular mechanics – from an accuracy point of view. From a sheer scaling point of view, the number of atoms involved means they are also beyond the scope of quantum mechanics. QMMM methods are also sometimes a poor compromise as these are discontinuous and focus on the local binding event. Interestingly, this is where the XED force field has a nice sweet spot; accuracy approaching that of QM, but speed and the ability to map larger numbers of atoms >30,000, which is highly appropriate for the analysis of protein ligand and protein-protein systems. We can do this accurately and consistently through deployment of careful protein preparation and minimization workflows on protein systems. The Centre for Pathogen Evolution at The University of Cambridge3 is involved in mapping data ultimately for the potential prediction of vaccine escape mutations of the influenza virus. Hemagglutinin virus protein is the receptor that recognises mammalian cell surface glycans as an essential route to host cell entry. The ability of the virus to recognise sialic acid containing glycans is essential to this process and residues that contribute to its recognition represent those which are consequently difficult to mutate without compromising the virus. Antibodies which are directed to this site (Figure 1 left and middle) are less likely to suffer from viable virus mutations than others 4,5 (Figure 1 right). Figure 1: Left: Influenza H3N2 hemagglutinin with the electrostatics of the core recognition element sialic acid from PDB 5VTQ. Middle: overlapping monoclonal antibody (blue tube) recognition site with electrostatics from key residues from PDB 2VIR. Right: a non-overlapping monoclonal antibody from PDB 5W42. In vogue, directed degradation mechanisms (PROTACS)/antibodies/vaccines, i.e., biologics, are example therapeutic paradigms which involve subclasses of these protein–protein interactions rather than the classical small molecule drug – protein target interactions. Modeling them is a significant challenge faced by many organizations charged with producing an array of diversely targeted therapeutics, because it is where a lot of what remains (the ‘higher hanging fruit’) happens to be. The biologics industry may have slightly different criteria for cycling through an optimization, but ultimately similar schemes to those operating in the pharmaceutical industry still apply. 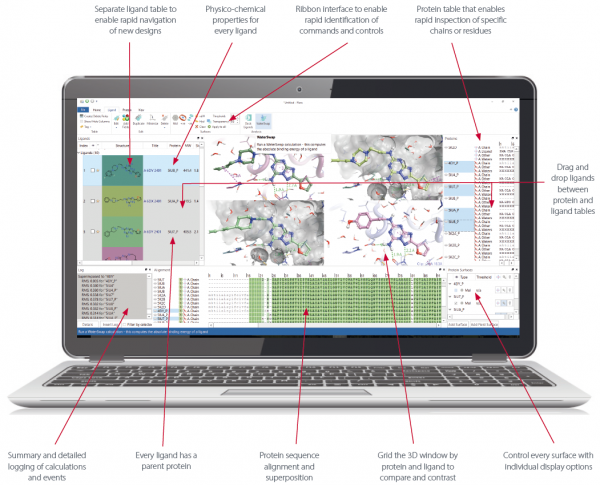 There is an equivalent of traditional medicinal chemistry drug discovery workflows – involving SAR analysis, design, synthesis and test cycles. For antibodies, as for small molecules, target affinity, solubility, aggregation are key initial concerns. Mouse to human transformation is a uniquely biologics issue (unless we are talking in vivo models) as is the means of controlling SAR. For proteins it is all in the manipulation of the amino acid sequence, protein loop conformational preference, by single or multiple residue mutation. Incidentally, conventional sequence similarity metrics are not a useful measure of a residues relative potential for interaction with ligands or proteins in active sites (despite often being the tool of choice for analyzing protein data), as they were derived from natural mutation propensity and that consequence on maintenance of protein architecture. Ultimately, the mechanism of target engagement, the molecular recognition event, is through electrostatic and shape complementarity and is fundamentally the same 3D phenomenon that applies to small molecules. Cresset scientists have an outstanding track record of working on electrostatic and shape complementarity and have successfully applied these skills to protein-protein interactions. In the last 12 months, Cresset Discovery Services has completed work on viral vaccine modeling and biologics modeling which have proved highly useful for clients. We matched observed binding events with calculated binding enthalpy trends and predicting a-priori the observed pattern of protein binding or unwanted peptide binding suppression. This has been done using WT or mutant proteins that we have successfully taken through analysis, modeling/design and client testing cycles. As you would expect, client confidentiality prevents us disclosing further details, but contact us for a free confidential discussion. Posted August 13th, 2018 by Martin Slater & filed under Services. Posted May 30th, 2018 by Martin Slater & filed under Services. As kinases have become a well-established class of therapeutic targets, it’s probably fitting that the theme of the RSC kinase symposium this year was relatively conservative, although a reasonably diverse selection of kinases (table 1) and therapeutic areas (table 2) were covered. It is remarkable that so many ATP pocket blocking inhibitors (i.e., most examples described this year) have translated to clinical candidates and drugs on the market, despite the fact that kinase biology, particularly the role and mechanism of kinase modulation by multiple protein complex formation as a prerequisite for signalling, is not very well understood. Table 1: Kinase targets 2018 symposium. Table 2: Kinase therapeutic areas 2018 symposium. The talk by Craig Malcolm (Promega UK Ltd) perfectly illustrated the lack of understanding of which processes involving kinases are actually operating in cells i.e., those which may, or may not, be therapeutically relevant and accessible. He described an interesting ‘different take’ on the standard kinase biochemical assay by using florescent kinase inhibitor probes as a technique to assay kinase activity in the ‘live’ cellular context. The talks by Klaus Okkenhaug (University of Cambridge and Babraham Institute, UK), and Roger Williams (MRC Laboratory of Molecular Biology, UK), offered in depth exploration of the intricacies of the lipid kinase family and the effect of the wider molecular and cellular context of these kinases on the therapeutic outcome. Klaus described how diverse this family is firstly with the PI3K delta inhibitor Idelalisib (1), which in combination therapy with biologic Rituximab for Chronic Lymphocytic Leukemia (CLL), serves to draw cells out of the lymph nodes so that they can be targeted by antibody treatment. The role of PI3K delta in immuno-oncology was evident in combination with CSF1 as this synergizes knocking out tumor cell protection. 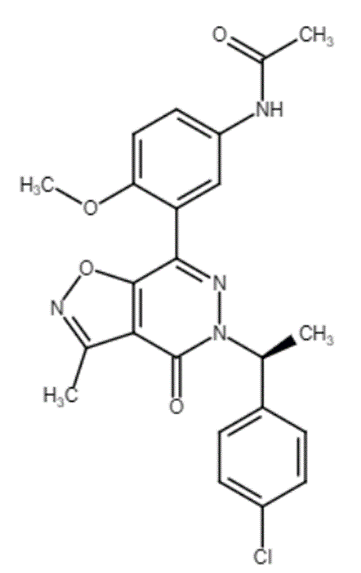 Finally, Leniosilib (2), is an anti-inflammatory agent through selective PI3K delta inhibition. In his talk, Roger described the VPS34 system and how the nature of multi-protein architecture governs specific membrane interactions and thus activation of this complex assembly. Figure 1: Left – VPS34 (human PI3K) with inhibitor (PDB code 4PH4); center – yeast VPS34 / VPS15 complex (PDB code 5KC2); right – the larger yeast complex (PDB code 5DFZ) showing the context of PI3K catalytic domain (in grey across the structures). In addition, James Reuberson (UCB, UK) went on to describe a PI4K 3-beta inhibitor for immune suppression (3) and Emily Hannan talked about Genentec’s selective PI3K alpha inhibitor and degrader (4) for breast cancer. 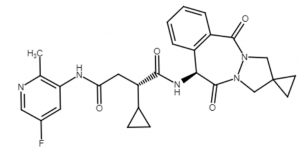 The latter molecule stimulates removal of PI3K, presumably by stabilizing a conformation that can be more readily ubiquitinated. Exceptions to the general rule of ‘ATP site binding inhibition’ were two talks describing the discovery and development of kinase ‘activators’ of AMPK (5) and then PINK1 (6). AMPK is an unusual kinase with an allosteric modulatory site above the ATP binding catalytic site. PINK-1 is also an unusual kinase which has extended loops around the catalytic domain responsible for binding and phosphorylating ubiquitin. PINK-1 interacts directly with an E3-ligase at the surface of mitochondria and modulates mitochondrial autophagy. 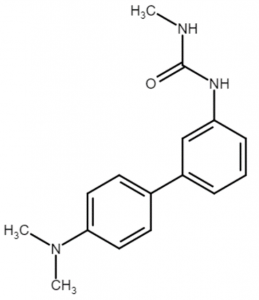 Youcef Mehellou, (Cardiff School of Pharmacy and Pharmaceutical Sciences, UK) described the use of novel ATP mimetic prodrugs which activate a form of PINK-1 that is mutated in Parkinson’s disease. Unsurprisingly, most talks focused on oncology as the major topic. Another sub-theme was accessing the CNS with kinase inhibitors for brain tumors or with CNS penetrating ligands for psychiatry or neurodegenerative diseases. 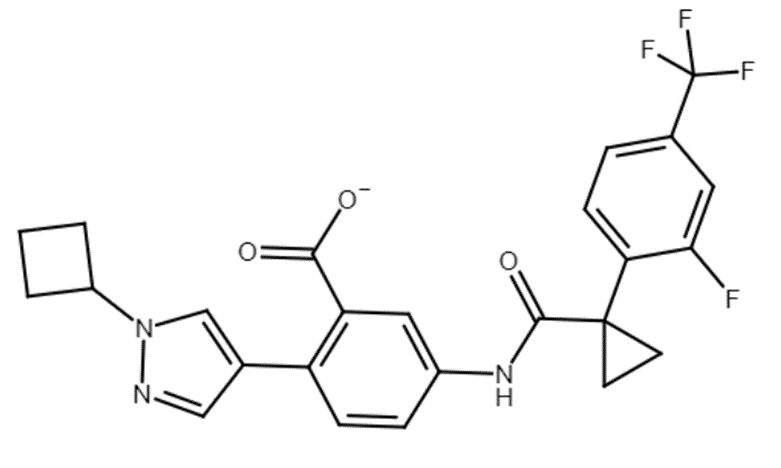 Compound 6 is an example of a CNS penetrating pro-drug. Most other examples focused on optimizing inhibitors either by multiple parameter optimization of calculated properties, or using experimental measurements such as compound measurement in brain slice homogenate as a component of their KPU metric. 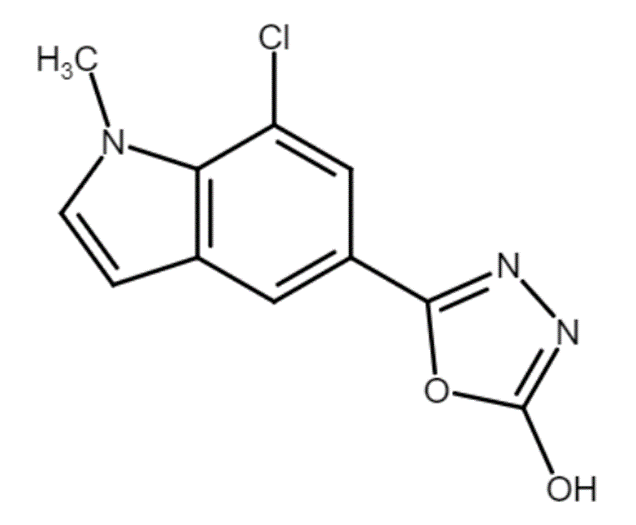 These include: a TTBK1 inhibitor from Lundbeck (7) for Alzheimer’s, the ATM inhibitor from AZ (8) for Glioblastoma, and the pan TRK inhibitor from Chugai (9) for brain metastasis. Note the absence of the classic donor-acceptor-donor hinge interaction motif. Figure 2: Lundbeck TTBK1 inhibitor (7) for Alzheimer’s disease (left – PDB code 4NFN) shows non-classical hinge interactions which are more evident using Cresset electrostatic field visualization (right) in Flare (cyan: negative potential; red: positive potential). Overall the symposium was interesting and informative. Contact us for a free confidential discussion to see how Cresset Discovery Services experts can advance your project. Posted March 27th, 2018 by Martin Slater & filed under Services. Posted February 28th, 2018 by Martin Slater & filed under Services. 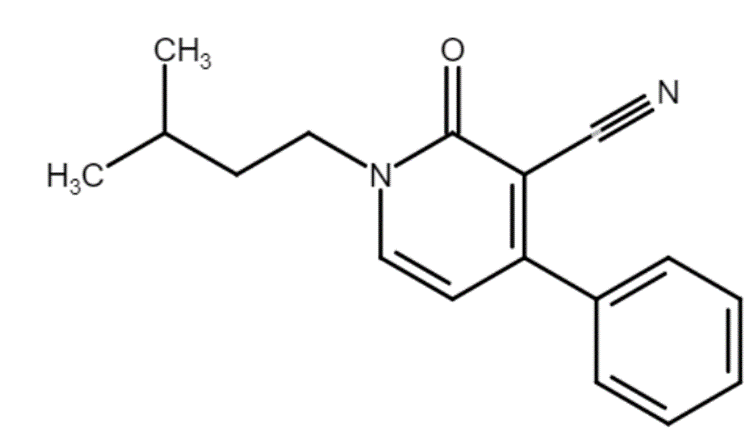 An older non-protease example is Clopidogrel. 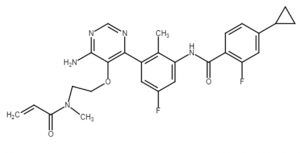 This P2Y12 inhibitor requires activation in vivo (through oxidative metabolism) to generate the electrophile intermediate (sulfenic acid) that forms a covalent disulphide bridge to a cysteine residue in the target GPCR. Unravelling the true mechanism of this compound led to second generation inhibitors which further exploit the covalent mode of action5. 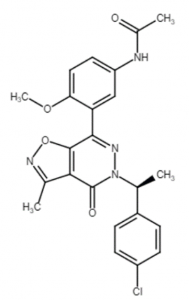 It removes competition with the endogenous ligand, as is true for other covalent inhibitors, but in this case is more significant as concentration of competing cellular ATP is in the millimolar range. 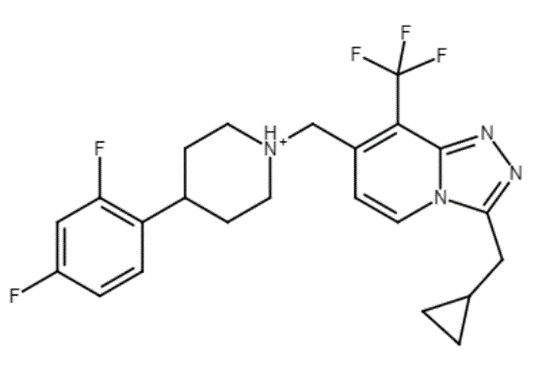 High efficacy, in contrast to some conventional inhibitors, gained specifically by using this covalent inhibitor design. 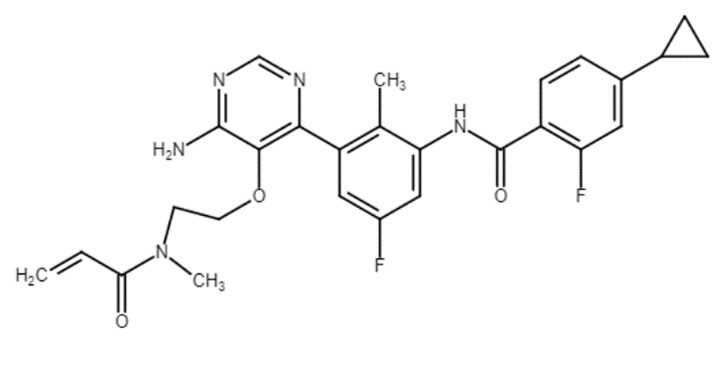 Figure 1: Ibrutinb in BTK PDB: 5P9J showing Cys-481 spheres near with the covalent linkage visualized using Flare a new structure-based design application from Cresset.6From a safety point of view, a method of achieving high efficiency/potency of any drug should translate into a lower dose that is ideally below any potential toxicity threshold (very few drugs are given at =< 10mg per day!). Similarly, prolonged duration of action, a consequence of the covalent inhibition, can result in less frequent dosage regimes that could be very beneficial – depending on the exact pharmacology. So why have drug discovery companies not adopted this approach more broadly? Mainly, because this is not a panacea – some proteins are more quickly processed, turned over or are mutated. The BTK case itself is an unfortunate example of the latter; the resistance mutation C481S produces a protein that cannot undergo the reaction with the inhibitor and ultimately limits its utility in patients. What may have more generally hampered covalent inhibition strategies in the past, observed particularly in the field of protease inhibitor design, was the high electrophilicity and poor selectivity. The very justifiable fear of off-target activity and threat of unresolvable toxicity issues, has contributed to the adoption of a dogma which still significantly disfavors the approach across the industry. The lack of a wider uptake of the approach since then has been exacerbated, perhaps, by the industrialization of experimental design and/or the lack of attention to the kinetic behavior of these systems. One size doesn’t really fit all! An appreciation of the kinetics of molecular recognition and its impact on drug efficacy (Figure 2) has had a resurgence; together with the introduction of biophysical techniques, such as Surface Plasmon Resonance (SPR), which allow the routine resolution of otherwise painfully elusive kinetic parameters such as kon/koff. Figure 2: Schematic of the covalent inhibition process (ki/Ki equivalent to classical Michaelis Menten enzymic parameters kcat/Km), transition state energy diagram for the covalent transformation. The observed rate of inhibition for a covalent inhibitor is effectively dependent on the ratio of the rate constant for the chemical transformation of the inhibitor (ki), relative to the rate of unbinding (koff). We can introduce a level of catalysis in this system if we design appropriate geometries that lower the energy of (i.e. favor) the E : I complex7. If we are talking about hand-crafting optimum molecular geometries, then we are usually thinking about utilising computational chemistry as a technique. Virtual calculations defining reactivity and ranking of electrophiles. Optimizing the molecular recognition toward the target enzyme by careful design of the ligand functionality through steric and electrostatic control. Optimizing placement of an appropriate electrophile on the inhibitor in relation to an accessible, non-conserved nucleophile on the protein. Selectivity of the covalent bonding step is governed by the choice of a suitable electrophile and proximity to the nucleophile. Optimizing the reactivity of the electrophile for a covalent inhibitor requires a balance between achieving a sufficient high rate of reaction with the selected nucleophile on the target protein as well as minimal rate of reaction with off target nucleophiles. We anticipate that this approach will prove increasingly useful, particularly for otherwise intractable biological targets involving large and complex protein-protein contacts. Cresset Discovery Services’ experienced scientists work alongside your chemists to solve problems, provide fresh ideas, remove roadblocks and add direction and insight to your projects.8 They offer expert molecular design capabilities and use cutting-edge technologies to provide support for numerous client projects, across a range of disciplines. To find out how Cresset Discovery Services can help you reach your next milestone faster and more cost effectively, contact us for a free confidential discussion. Bauer R.A., Covalent inhibitors in drug discovery: from accidental discoveries to avoided liabilities and designed therapies, Drug Discov. Today, 2015, 20 (9), 1061-1073. 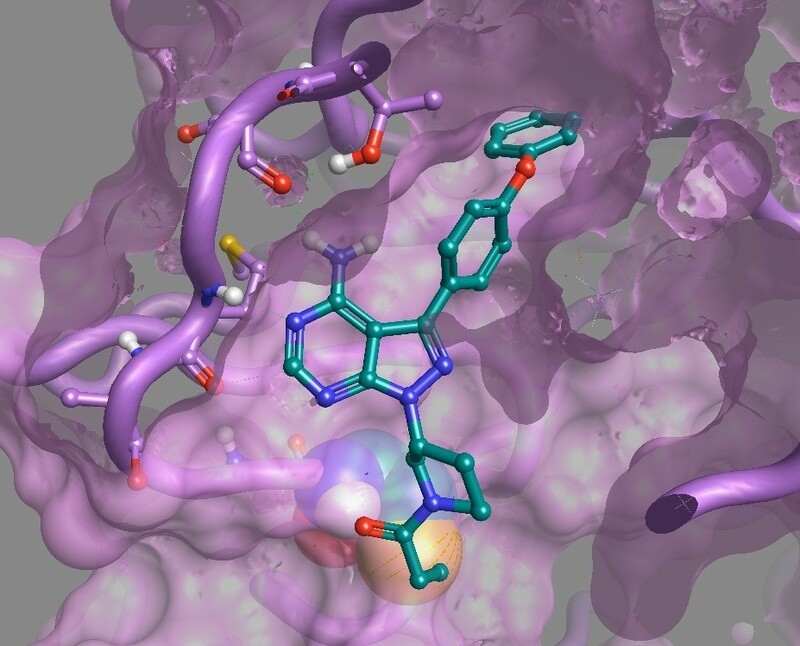 Baillies T.A., Targeted Covalent Inhibitors for Drug Design, Angew. Chem. Int. Ed., 2016, 55, 13408-13421. De Cesco S., Kurian J. Dufresne C., Mittermaier A.K., Moitessier N., Covalent inhibitors design and discovery, Eur. J. Med. Chem., 2017, 138, 96-114. Lagoutte R., Patouret R., Winssinger N., Covalent inhibitors: an opportunity for rational target selectivity, Curr. Opin. Chem. Biol., 2017, 39, 54-63. Exploring synthetically accessible alternatives to P2Y12 antagonists using electrostatics and shape. See ‘Hammond postulate‘ for an exothermic reaction. Posted November 8th, 2017 by Martin Slater & filed under Services. In October, I presented Computational approaches to ion channel drug discovery at the ‘USA Integrated Drug Discovery Spotlight Event: Overcoming Challenges in Ion Channel Drug Discovery and Safety’ hosted by Concept Life Sciences and Metrion Biosciences. Structure-based molecular modeling approaches are probably the most acceptable form of computationally driven rational design deemed useful by the medicinal chemistry community for drug discovery. 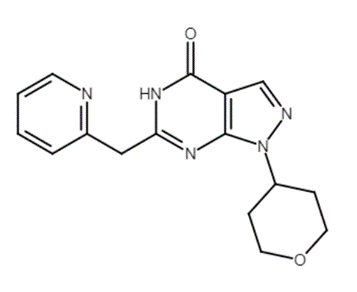 For unliganded projects, invariably, medicinal chemistry is a painstakingly slow process. Ion channels are inherently difficult protein targets to tackle as very few have been crystalized. Strangely, it seems that the greater the knowledge we accumulate – the deeper the complexity. Alternative approaches e.g., chemogenomics and good ligand centric approaches, are vital to squeeze out all valuable insights from this ‘costly’ SAR data. Cresset has a reputation for producing powerful software for ligand-centric molecular modeling. Analyses involving molecular 3D shape and accurate electrostatics, via Cresset’s proprietary multipole force field (XED), allow fast and informative interrogation of SAR in the absence of structure data. I describe the current diversity of the ion channel target space and highlight some of the issues faced. Flare expands Cresset’s product portfolio into structure-based molecular design, bringing our electrostatic workflows into the protein realm. Electrostatics are fundamental to ion channel function. These techniques are highly likely to prove very useful in the ion channel drug discovery arena, as more appropriate techniques for providing structure data become available e.g., CryoEM. I make the case for information based strategies and ligand centric techniques, particularly computational workflows used by Cresset Discovery Services for customer projects, which pit the efficiency of rationality against blind trial and error. Posted September 25th, 2017 by Martin Slater & filed under Services. Posted July 17th, 2017 by Martin Slater & filed under Services. It’s a long journey from hit to lead, and the path is called optimization. Your discovery program started with some promising leads from a high throughput screen. The biology has been done and the chemistry has shown that there is an effect on the biochemical assays. You have a series of hit molecules, a set of required parameters, thousands of data points, a team of chemists, a budget and a deadline. Now the optimization work begins. Identify any gaps in your data so that you can decide what further work needs to be done. The more you know, the greater choice of intelligent steps you have. Make sure you have the best possible understanding of your molecule-target interaction, giving you as many optimization options as possible. Balance diverse properties. Visualization and multi-parameter optimization tools can transform your ability to understand the impact of changes across different compounds. Stay in the active window as you make minor changes. 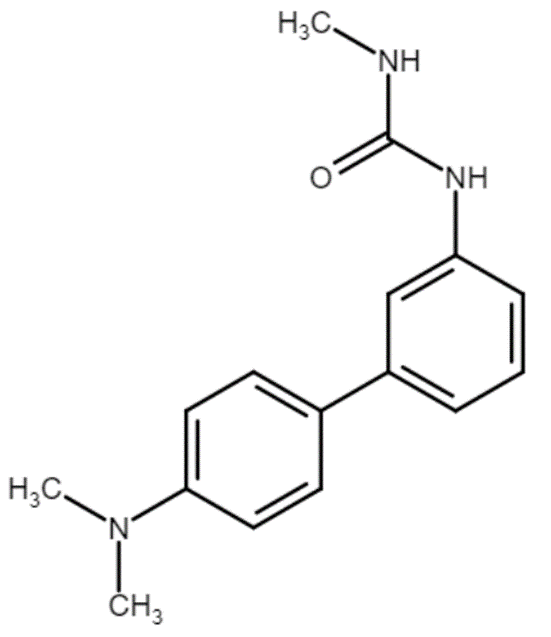 Building an activity pharmacophore helps you to understand how far you can take the changes. Escape any liability from toxicity or pre-existing patents. Fragment replacement methods can be invaluable for moving to new areas of chemical space and adding new ideas and directions to your research. The optimization decisions you can make depend on the data you already have. Activity Cliff Summary: What do the activity cliffs tell us about the SAR? 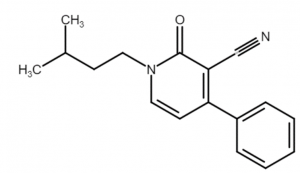 Average of actives: What do active molecules have in common? Regions explored: Where have I been? For a new molecule, would making it increase our understanding? 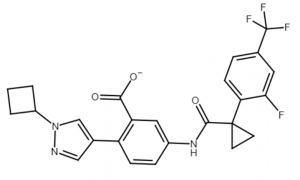 This analysis also calculates a novelty score for each molecule. This approach is also helpful in looking at toxicity and other liabilities. 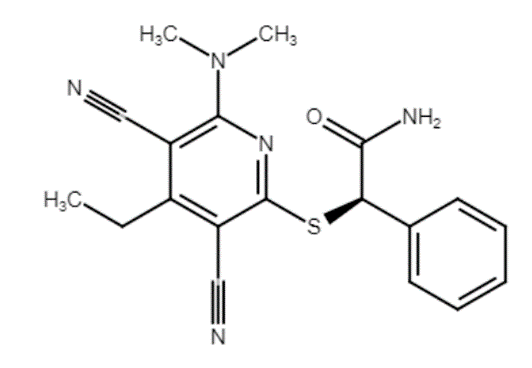 For example, you may be optimizing a molecule that was identified from a screen. It is active, but has some undesirable chemistry. If you can understand as much as possible about the SAR, electrostatics and shape you are more likely to discover a better way to escape a liability. The more you know, the greater choice of intelligent steps you have. 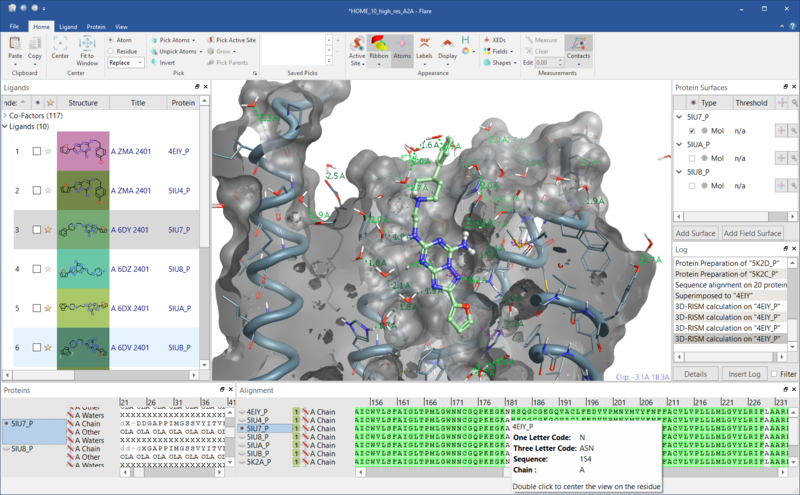 Figure 1: Activity Atlas condenses your structure-activity data into highly visual 3D maps that inform the design and optimization of new compounds. Understanding how your hits interact with the target helps you to optimize the affinity of your compound. In structure-enabled projects Flare, our new structure-based design application, can be used to analyze the protein-ligand system, calculate the energetics of ligand binding and analyze the water stability and energetics. Without knowledge of the target structure, you may need to go back and deduce ligand-protein interactions from your hit so that you have a clearer understanding of the binding mechanism. 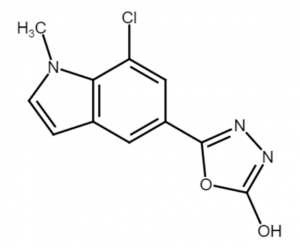 This knowledge makes it far easier to optimize the affinity of your compound. You get an extra level of insight to this process with Cresset techniques. Our electrostatic, hydrophobic and shape based analyses make it clear which chemical changes can have the largest biological impact. Compounds that come out of the screening process generally have weaker potency than is required, so one of the first tasks is to increase the activity. 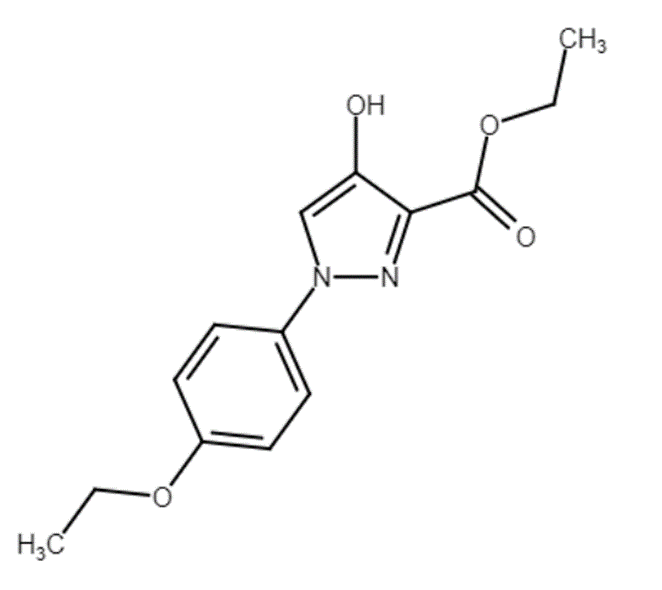 This is usually done by making small changes to the molecule and testing their effect. However, there is a range of properties besides activity that need to be optimized. Firstly, drug molecules need to be stable and small. Larger molecules are more likely to have off-target effects and have more problems travelling through membranes. 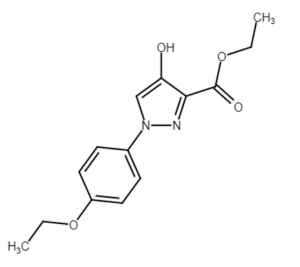 They are also likely to have more complicated chemistry, making them harder and more expensive to synthesize. One of the key steps in optimization is to retain as many components as are required to make the compound active, but no more. The difficulty is that when you change one property you tend to change others. Computational visualization for multi-parameter optimization shows you how the changes you are making affect other molecular properties. For example, you may want to simultaneously optimize the polar surface area and the LogP. The Torch and Forge radial plots can be set up to define acceptable project ranges for project data and in silico–calculable properties. Contact Cresset Discovery Services for a confidential discussion about how we can streamline your optimization.